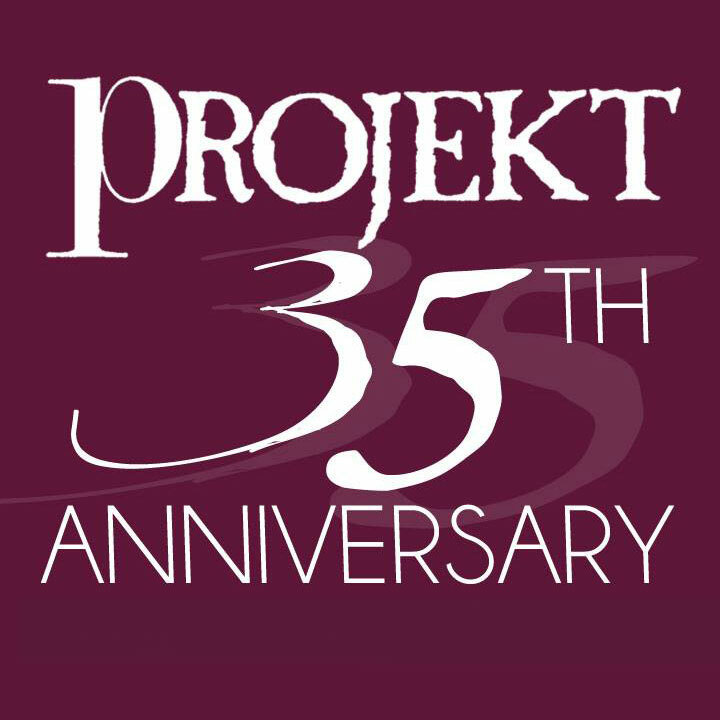 35 years of Projekt rec. In mid-July of this year (2018), I was interviewed by Pavel Zelinka for the Czech Magazine UNI. The article was scheduled to be out in August, but it never came out; now the interview is published in Czech at sanctuary.cz. I was waiting to post the English version here at the site until they went live. However, re-reading my answers, I see that over the last three months some of my thoughts have changed. I’ve returned to what I said and updated a bit (in #9 & #15 specifically). This is the true-to-the-moment version of the interview. This is two things. It’s a history of Projekt, and in the final answer it’s a statement of thoughts on revamping my strategy at Projekt. 1 First question – why the name Projekt and why with K except C? My mom was Swiss German, I like to say it has something to do with her being from Zurich; but honestly I saw the word “Projekt” with a K on the back of a Peter Baumann LP, and I found that cool and interesting. 2 Many articles say that you set up Projekt as a way to release your own solo music. Is it true? If yes, when did you open the label to other bands and projects and why? Projekt started in 1983 by releasing a couple of cassette compilations of local artists from South Florida where I lived, followed by my own solo electronic music. In 1986 and 1987 and 1988 they were LPs and then a CD from my band black tape for a blue girl. The first other band was a Best Of from England’s Attrition in 1989. The “why” is I created my own label so that nobody would tell me how to make my music. I had talked to and read interviews with many bands, and the idea that record-label-guys would poke their fingers into my art was really unappealing. I was going to make what I wanted to make. And when I began to get interest in my music, I thought I could offer that opportunity to retain control to other artists. I had been friends with Martin from Attrition for a few years already (we met via my fanzine), and I thought it would be great to introduce people in the USA to his music, via my label. 3 When did you start to think that running a label should be your daily job and when it happened in reality? When I started the label in 1983 I was going to college, in 1986 I moved to California for college, in 1988 I graduated and I started working in computer graphics. I never thought Projekt would be my job. The label was able to afford to release CDs because of the good money I was bringing in from the graphics job. However, it got harder and harder to run the label, because the job took me out of town two to six weeks at a time. This was back before the Internet, it wasn’t possible to keep up on the label work during those long periods away. I had to shut it down for a month at a time. It became necessary to quit the day job — which was paying quite well — to focus on the label fulltime That was around 1991 / 1992. When I released the debuts from Lycia, and Love Spirals Downwards. Along with black tape for a blue , the label’s bands were having a lot of success, and I just couldn’t go away anymore. I’ve been doing the label full time for 27 years! That’s a long time. Most labels don’t even last 5 years. 4 From the beginning you focused on darkwave and ambient music. Why just those two genres? Almost all of the early cassette releases were electronic music. Then black tape for a blue girl was born as a mix of ethereal and electronic and goth, it led the label into that direction. The label always followed what black tape for blue girl was doing. With my band releasing albums in the darkwave genre, and setting up networks for distribution and publicity within those genres, it made sense to add more artists to the label that would appeal to the same audience. 5 What about similar recording companies in USA/Canada? Was there any competitive fight between Cleopatra/Middle Pillar etc? I really don’t believe in the idea of competition. I think that’s just a story people like to create to make things sound more interesting; really we were all doing our own thing. I am much more about collaboration, rather than competition. Not necessarily with those two labels, but I worked a lot with Matt and William at Tess Records. And I still like helping out other bands. Ultimately, it never felt like Projekt was in competition with Cleopatra or Metropolis, it was not about success at the expense of the other. 6 You started to collaborate with Steve Roach in, let’s say, early stages of Projekt life. How did that happen? When I lived in Florida in the mid-80s, I had already heard of Steve Roach, I think we might have exchanged some mail. When I moved to California in 1986 I saw him play live. Then in 1988, Steve produced the album from my roommate, Walter Holland’s Transience of Love. That’s when we started talking more often. He contributed a track to Projekt’s 1993 compilation From Across this grey land No. 3. The first album I released from Steve was his 1995 collaboration with vidnaObmana, Well of Souls. Since that time, I’ve released about 100 of his albums on the label. We talk almost every day, working on so many different projects together. 7 You are collaborating with really important names for American gothic scene as Lycia, or Voltaire. Both with not typical Goth sound. What was the reason that you started to work with them? The simple reason is that Projekt released records from bands I enjoyed listening to. Mike from Lycia sent me a lot of demo tapes over the course of a year or two. When he made new songs, he’d send them over. At some point I said, “OK this is really good! We should release an album!” That became 1991’s Ionia. With Voltaire, I had heard his name somewhere, and then he opened a show for black tape for a blue girl in New York City; he performed most of the songs that became the first album. We talked after the show, he’s a great guy, charismatic on stage and in person. I enjoyed his sound and humor, and it was obvious that there was an audience for what he was creating. He recorded the debut album without any Projekt involvement; whereas with bands like Lycia, SoulWhirlingSomewhere or Love Spirals Downwards I was more involved, either with the mixing, or song order, or album cover art. Voltaire’s The Devil’s Bris was released in 1998. 20 years ago! 8 Over the years the ratio between darkwave music and ambient sounds prevailed in favor of ambient music. Why? Honestly that’s because people still buy ambient-electronic music. On the darkwave side, only Voltaire continues to sell really well. Most of that is digital. (addition: Projekt is releasing the new LYCIA and BlackTape, and there is a lot of interest in these releases, so the preceding sentence might need to be updated). However it seems fans of ambient-electronic are still willing to pay for music. I focus on where the money is, right? I’m running a business here! 9 I remember longer ago, when you have blogs on your web side with slogan: I love mp3. How it happened and is it your relationship with this format different from those days? I honestly don’t even think about the format anymore. It’s whatever people want to listen to. I don’t remember loving mp3s. I remember the audience loving MP3s. As a business, it’s smart to provide what the customer wants. For a decade they wanted digital downloads. But now, if it’s MP3 or FLAC, or streaming, it’s all the same to me. I suspect your question is more like, “What is your attitude towards digital music these days?” The answer is digital is about 72% of Projekt’s income, so I love it because it’s how people are getting music. Streaming is doing amazing for the bigger artist; it brings in a lot of our income. Even though personally, I love tangible objects, I love album covers, I love album artwork. Yet I have accepted that the majority of the audience has moved away from caring about the physical object. Frankly, I rarely take out a CD to listen to music. Sure, last night I listened to five CDs from the 80s, four of which were from Harold Budd. In my office, I stream music like everyone else. 10 I know you had a really complicated relationship with streaming platforms such as Spotify and others. Is it because of their financial behaving to musicians or you don’t like that way of consuming music? My relationship is not complicated at all anymore. Spotify pays money and I take that money and I pay the artist their royalty! As a business I think Projekt has to go with what the audience wants. Wherever people are doing their business, Projekt has to be there. Yes, it would be nice if streaming paid more. But it doesn’t, and it won’t. For years and years I griped that streaming didn’t pay a fair rate, and it was killing the music industry. Well guess what? I was (sort-of) wrong. Yes, it still doesn’t pay a decent rate, but streaming has actually turned the music industry around. It’s now half of what most labels bring in, even with the low rates per play. I was speaking to a guy a few days ago, a musician who still has the attitude that streaming is horrible, and it’s the death of the industry. I can’t agree. I know that small bands don’t get enough streams to add up to much money. But for the more popular bands, it’s really a lot of income. I cannot complain about it. If fans want to stream, and I can write nice checks to the bigger bands on the label, it seems that listeners are getting satisfied. I talk to artists (on other labels or on their own) who won’t put their music up on streaming. I think that’s absurd because so much of this industry is about streaming. News articles say it’s pretty much just streaming & vinyl. Download is dying quickly. CDs have pretty much died already. Streaming is where people hear music. It would be unwise to say I’m am against streaming nowadays. 11 You’ve had some success with the Kickstarter/crowdfunding model; what are your thoughts on the way artists and musicians have utilized the various platforms that exist? I have done 10 successful kickstarters and I think it’s a great way for artist to connect to their audience. I don’t think creators can afford to stick to the past and try to focus on strategies that don’t work anymore. Crowdfunding is a great thing for artists. However, it is hard for a new band to succeed at crowdfunding because they don’t have the name recognition, and they don’t have the reach to get fans involved. Black tape or a blue girl had albums in the heyday of the music industry in the 80s and 90s, so I’ve got a lot of fans out there. For me, part of each Kickstarter is reintroducing fans to my music, fans who have forgotten about the band, or didn’t realize I was still active. It’s been a great way of spreading the word, and funding my art. So I like it! 12 What do you foresee as the future of this model, at least with regards to you and your artistic pursuits? It’s definitely the biggest part of the way I fund my own music nowadays. I’m not suggesting any other artist should feel required to do it, if they don’t want to. Crowdfunding is a lot more direct and driven, and you have to really be willing to ask your fans for money. Some artists just can’t do that, they don’t like that taste in their mouth. I think all artists are putting out a hand and asking for money, it’s just what method they chose to use. And how they feel about being direct about it, rather than subtle and sticking to the old model (CD sales). For Blacktape — and my solo electronic music — it is definitely the way to go. I really like it because I connect to the people who love my music and I talk with them and get to know them. I love it. I find it to be a nice exchange with the people who care about what I do. 13 You are putting a lot of Projekt music out on Projekt’s Bandcamp portal for free. Why? I know that sounds contradictory, but the fact is that putting music up for free gets a lot of music heard by the audience, and some of those listeners donate a few bucks, and that adds up. I did a comparison recently for an artist with two albums seven months apart. Guess what? The one up for free for a week and the subsequent paid release brought in exactly the same amount of money. The difference is that free was a viable way to get a lot of people to hear the music. People are into this. For many musicians it is more important to get their music heard vs. making money on the release. Because — sadly — very few bands in these genres make money on their releases, anyway. Getting people to download and listen to their album helps builds a fanbase, who maybe later will support with a purchase. That’s a big maybe, mind you. 14 Projekt is not only pure recording company, but also distributing platform for European labels, via your webstore. How important for you is, to be also re-seller of another Gothic related labels? It’s really unimportant to me to be a reseller of other Gothic related music. Joe (who runs the webstore along with many other music-related businesses out of his shop in Philadelphia) continues to sell other labels at projekt.com, but sales are nothing like what they used to, because people just don’t buy much on CD anymore. At the peak of sales — in the mid 90s — Projekt must have sold 1000 copies of each of the first two Faith & the Muse albums, released on Tess Records. These days for non-Projekt releases, if we sell 25 copies of an album… that’s amazing! Americans just don’t buy a lot of CDs anymore. It’s unfortunate, but I am realistic about that. It’s a nice service having those albums in our webstore, and Joe enjoys doing it. If I had to run the webstore out of my house, I wouldn’t add all the extra work and headache. So thank you Joe for still caring about this music! Update: The new Dead Can Dance album has sold extremely well in the webstore, as do Lisa Gerrard albums. So there is one place that the webstore is still doing well with non-Projekt artists. 15 How it happened that Sam Fogarino from The Interpol worked for you as an employee? Was he big fan of Projekt music? Ha ha that’s a funny question, because I don’t remember (laughs)! Sam was friends with Patrick (of Thanatos who used to work for Projekt as my publicity manager in the 90s). Pat got him the job for a few weeks or months. I don’t remember? I don’t know if he liked Projekt’s music. 16 A statistical question for you: which Projekt album sold best? The best selling CDs were compilations that we did with the Hot Topic chain here in America. The new face of goth and Projekt: Gothic. They sold for $4 on the counter of the Hot Topic store in the mall. That doesn’t exactly count in my book, because people didn’t necessarily buy them because they knew the music. They bought them because they were in a Gothic store in the mall! And that’s cool because I think a lot of people discovered the label that way. They sold around 25,000 copies each. The best selling album from an artist was black tape for the girl’s 1996 Remnants of a deeper purity. It keeps selling to this day. Voltaire’s albums are the top-4 sellers every month from our digital distributor, and then a lot of Steve Roach rounds out the top-10. 17 You are recording the new album of black tape for the girl, To Touch the Milky Way. Are you plan to put some rough mixes from studio out and are you going to release also on vinyl? The album is finished and is coming out at the end of October. I funded it via Kickstarter, raised $12,278 to make the deluxe vinyl and CD edition. It’s amazing and beautiful, and I hope everyone takes the time to give it a listen when it’s available. 18 You also run seven successful Projektfest. How important for you was it to do this “music gathering” and are you planning more for future? I will never do a festival again, sorry. The fests in 1996 and 1997 in Chicago were amazing, with over 1000 attendees. It was really successful, and fun to have so many of the label’s bands in one place so I could meet & listen to everyone. The fests were also incredibly stressful, logistically and monetarily. Patrick and Lisa and Charles did a lot of work to make those a success. They deserve a lot of the credit. The fests after 2001 had low attendance. Post-9/11, people in the US don’t have the mentality like in Europe about spending money to travel to a darkwave festival. If somebody wanted to put up the money and do half the work, I’d get behind the idea. But I’m not interested in taking the risk anymore. Better would be if the WGT would put up the € for a Projektnight in Leipzig. I don’t think there’s much chance of that, though. 19 What are plans for Projekt Records for the future? Projekt is consolidating and focusing on the top-7 artists. I aim to have less record label work, and more time to make my own art and enjoy my time (hang out with my son, and my partner Mercy, and read, and pet the cat). There was a time in the 90s when I worked 60+ hours a week at Projekt, I had 11 employees. It never was easy for little fringe labels back in the day, I was $180,000 in debt at the end of the 90s, and I’m never going back to that stress again. No more! Looking back at the last 35 years, the label succeeded! I want to give a high-five to all the artists, and all the employees over the years. We did it! But what was “it?” In retrospect I see my mission was to release a lot of unknown music, develop bands, and introduce the label’s fans to great records they might not otherwise have heard. That worked and some of the artists I discovered became well known in these genres. The label did a wonderful thing and had nice successes along the way, as you’ve mentioned. But realistically, over the last ten years the old strategies stopped making sense for a lot of the music I wanted to release. I can’t continue to put out new artists that people don’t want to buy, and end up with mountains of unsold CDs in the storage space. That’s not working anymore. These days people discover bands and then stream the music, which is great from an enjoying-music perspective, but not so great for bringing in the income to pay the small artists (and cover my costs). My plan for Projekt now is to refocus and have a new mission. Or rather, refine the mission to focus on the top artists. As a creator, I’m good at change, adapting, discovering the new path. That carries over into life and into business. It is extremely rare that a business survives 35 years. And even more rare that a small underground label like Projekt survives without a big hit (Projekt’s variation on that is having two artists who continue to bring in new listeners to their music: Aurelio Voltaire & Steve Roach). I appreciate all the years of your support, that’s why I have a roof over my head and food on my plate. I’ve been fortunate to earn my living for the last 27 years from Projekt. Thank you. Many of the people reading this still buy new music and support artists they love. We’re all grateful for that. However there are a lot of people I hear from (on Facebook, etc) who are only into the 90s-era of the Projekt label. It’s great to know the music from back then had a positive effect. But I want to point out that most of us are still here making music and when people purchase or support our new work, shows, etc, we can pay our bills. So please support the artists you love. Not just the ones on Projekt, but all of them! Thanks for caring, and thanks for putting some of your hard-earned cash towards your favorite bands. And thanks for the interview and letting me talk about these things.